Is your Ethernet not working in Windows 10 when you try to access the internet? Well, it is an issue that may occur out of the blue, and hamper your internet connectivity. There could be several reasons behind the issue with ethernet not working on your PC. 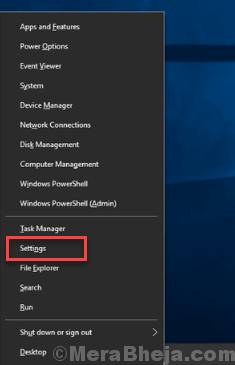 An issue with the ethernet cable, port issues, ethernet driver issue, or some internal Windows settings could be the reasons why your ethernet is not working in Windows 10. So, what are the ethernet connectivity issues that can show up? 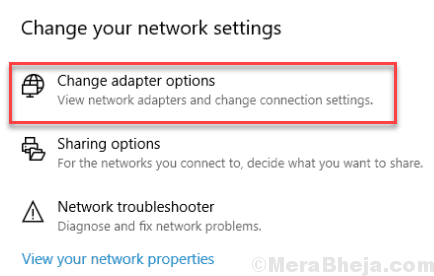 In the following article, we are going to cover the solutions to several Ethernet not working related issues in Windows 10. Check Ethernet Cable: It is important to make sure that the ethernet cable is working fine. Doing so will help you know if the issue is with your PC or just the ethernet cable. First of all, check physically if the cable has some sort of damages or if the connectors of cable on either side are damaged. Also, check if the ethernet connection is not loose on the connecting ports. If everything looks fine, try to use another Ethernet cable that is in working condition (from another PC) on your PC. If the other cable is working fine, then the issue is with the cable, else the issue is with your PC. Change the Ethernet Connection Port in Router: If you are a home based user, your Ethernet cable is most likely to be connected to a port on a router device. There are 2-3 ports on a router usually that can deliver output ethernet connection. Try to change the port of the output ethernet from your router and see if that works to fix the ethernet not working in Windows 10. 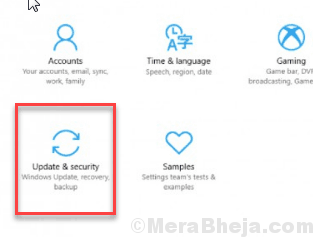 Once you have made sure of the above two points, proceed with the solutions to fix Ethernet not working in Windows 10 if the issue is with your PC. Step 1: On your keyboard, tap the Win + X buttons together. A menu will open up; click on the Settings option. Step 2: The Settings window will open up. 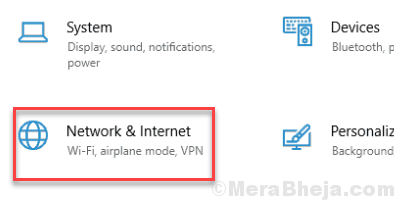 Here, click on the Network & Internet option. Step 3: On the left pane of this window that opens, click on the Ethernet option, then, click on the Change adapter options from the right pane. Step 4: A Network Connection window will open up. Here, look for the Ethernet connection, then right click on it. 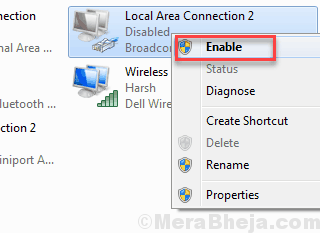 From the right-click menu, select the Enable option. If already enabled, disable it, and then enable it again. Now, check if the ethernet is working. If not, try next solution to fix Ethernet not working in Windows 10. Step 1: Press Windows + X keys at a time on your keyboard. A menu will open up; click on the Device Manager option there. Step 2: The Device Manager window will open up. Expand the Network Adapters option, where you will find the Ethernet driver. Right click on the driver, then from the right-click menu, click on Enable. 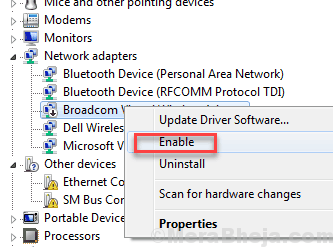 If the driver is already enabled, disable it and enable again. After doing so, restart your computer once. See if the ethernet is working. If not, try the next method. Step 1: Press Win + X buttons on your keyboard to open Win +X menu. Here, click on the Device Manager option. 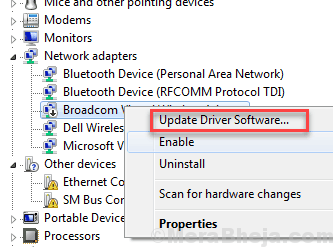 Step 2: In the Device Manager window that opens, there will be a list of drivers. Go to the Network Adapters and click on it to expand. From its options, right click on the Ethernet driver. 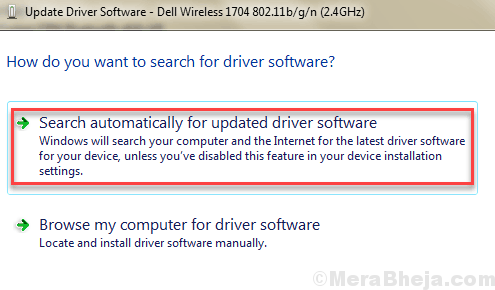 Now, click on the Update driver software option from the right-click menu. 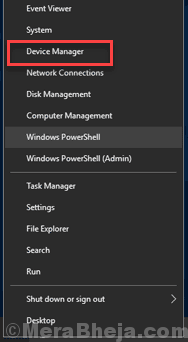 Step 3: In the Update Driver window that opens, click on Search automatically for updated driver software. Your PC will begin looking for an updated Ethernet driver. It will be updated once a driver is found. Once the update process is complete, restart your PC. After that, check if the Ethernet connection is working. If the answer is still no, give the next method a try. Step 1: Press Windows + X, and from the menu that opens, click on Settings. Step 3: Now, in the new window, from the left panel, click on Troubleshoot. Then from the options that show up, click on Run the troubleshooter option. 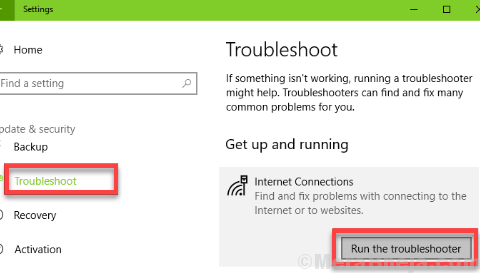 If there is any problem in your PC related to ethernet, Windows will detect it and fix it. If this method doesn’t work, try the next one. Antiviruses are notorious to cause problems related to internet connectivity. If not anything, the Antivirus in your PC could also be the reason for Ethernet not working in Windows 10. Simply disable your Antivirus for a while, then try to access the internet through ethernet. If you are able to access the internet, then you will need to the customer support or check the manual or help book in order to allow Antivirus to let your use internet via Ethernet. You may also get some error messages like Ethernet Doesn’t Have A Valid IP Configuration while connecting to the internet via ethernet. In such scenarios, make sure you are providing apt solution according to the error. Please let us know, which one of these methods helped you out.